Josh Krulewitz, Vice President, Public Relations for College and News, ESPN Media Relations. Josh and I have had our strong disagreements on things, but he has never let that get in the way of his professionalism. And as they might tweet on #espnfavrerulesforall, you gotta respect that. 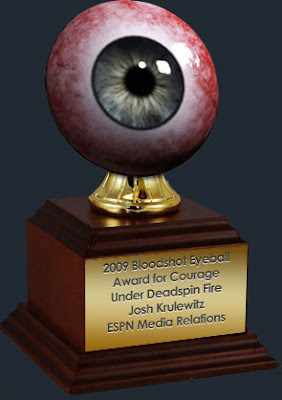 But what you have to respect even more is how Josh handled being viciously attacked by Deadspin for they way THEY feel he handled the Steve Philips incident. Even though many of us get frustrated when media relations people parse their words and answer exactly what the question is, that is their job and he was doing his job. Overall the whole Steve Philips incident was an embarrassing one for ESPN, and Deadspin did their best to drag ESPN and Josh through the mud. But he continued to do his job in the way he always does: as the consummate professional. Josh Krulewitz was promoted to as vice president, public relations for college, news and networks information in the communications department at ESPN in 2006. In this role, he oversees publicity efforts for the hundreds of college sports events annually on the ESPN networks and ABC, including college sports network ESPNU, and sports news programs, including SportsCenter and the all-sports news ESPNEWS network, as well as the network information area of the department, comprised of listings, the media web site, photography and viewer response. He had held the position of senior director, communications since 2005. Krulewitz has been with ESPN’s communications department since before he was graduated from the University of Connecticut in 1992 with a bachelor of science degree in business management. He was an intern as an undergraduate in 1990 and 1991 and joined the company fulltime as a publicist in 1992. He was promoted to senior publicist in 1995 and to coordinator in 1996. He was promoted to manager in 1999 and to director in 2001. Among the major successful publicity campaigns he has handled are the launch of ESPN2 in 1993; numerous editions of the X Games and Winter X Games; 1999’s SportsCentury project, the Emmy- and Peabody-Award winning review of the 20th Century in sports; and ESPN’s unprecedented coverage of the entire NCAA Women’s Basketball Tournament. He also has been the department’s point person in issue management, in particular with regards to studio programming and personnel. In 2008, he was named a recipient of the Katha Quinn Award, given by the U.S. Basketball Writers Association. It is presented annually to individuals who service members of basketball media, in honor of the former St. John's Univ. sports information director who died in '88. He also is a key member of the company’s V Foundation Committee, which supports the efforts of The V Foundation for Cancer Research, and is director of ESPN’s annual employee golf tournament.